A few years back, I remember the initial hype of #WCW posts. If you’ve been living under a rock or are a total geek, you probably already know that #WCW = Woman Crush Wednesday. A day where social media users alike share their love for the women in their lives, whether they are their significant others, BFFs, family members or what have you; these posts are special. I always feel like there are SO many amazing women out in the world, it can be a struggle to choose just one to make your #WCW. So I decided to make this a weekly thing when I get the opportunity to highlight PHENOMENAL WOMEN that I know or have heard of, and are beyond worthy of a simple #WCW post, they deserve more than just one day of Love and Recognition and we hope that we can celebrate their FABulous Lives here! This WCW is VERY near and dear to my heart, we’re as close as close can be, but what do you expect when you were roommates for years?! My sister is one of my biggest influences and biggest motivations. No matter what passion the other may be nurturing at the time, you can guarantee that the other was less than a step behind ready to assist in any way. I remember her telling me of her idea for Help Her, Period, I remember how surprised but patient she was regarding the tasks that God had laid upon her heart in regards to helping those in need around her, and to see her vision come to life is amazing. 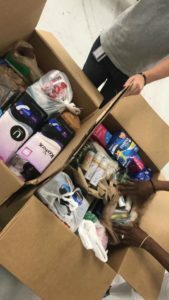 Just recently, she gathered over 10,000 donations in just a weekend from hundreds of women around the country and these items will go to help our homeless friends all over the state of Florida! 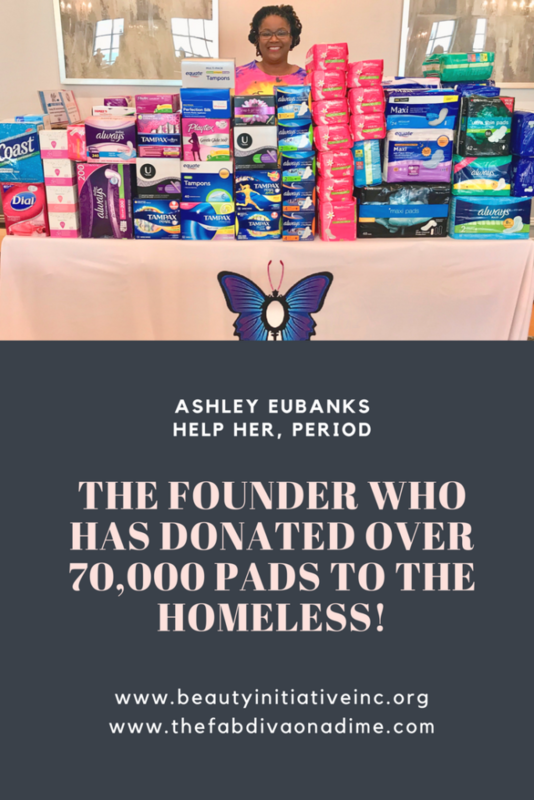 With just a little over a year of gathering and dispersing donations, planning packing parties for volunteers to enjoy themselves AND give back, Ashley has become known as The Pad Plug in the streets of South Florida and everyone knows her by her Teal Bags she passes out. My #WCW for the week understands that giving doesn’t stop after one day. 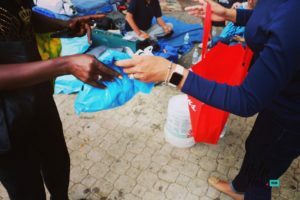 Helping the homeless on the streets of South Florida are only a start for her, as the outreach never ends because this giving is a lifestyle for her! 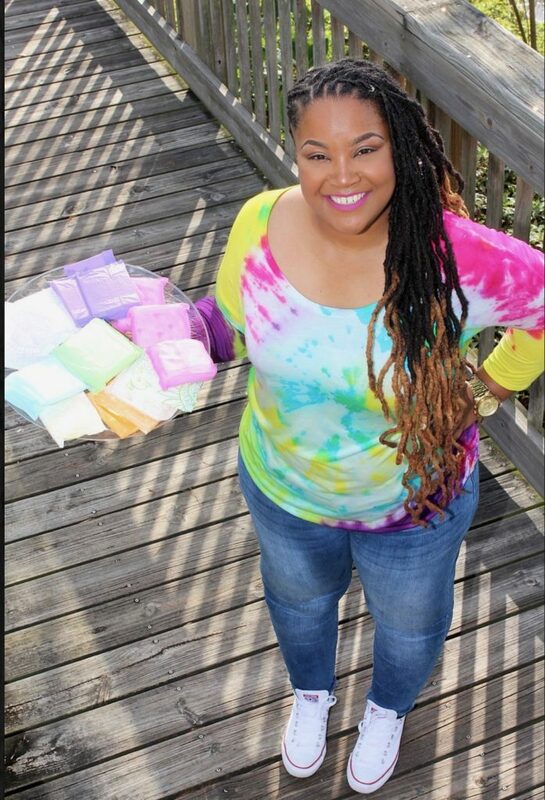 When the recent hurricanes hit Texas, Florida and then the Caribbean, Ashley thought about those needing not only toiletries, but the women and girls who would be needing pads/tampons and so much more. 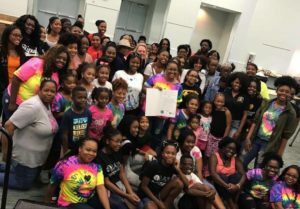 Immediately, Ashley sprang into action and shipped out boxes to any place in need … while she, herself was dealing with having no power in South Florida. 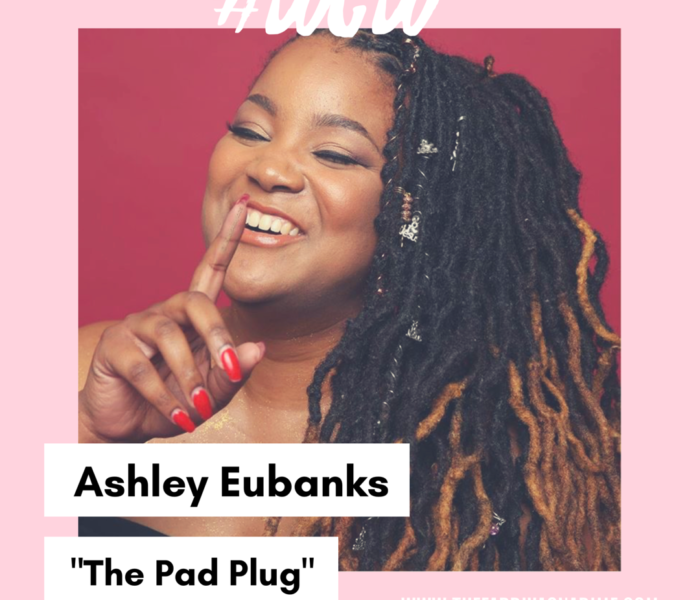 My WCW, Ashley L. Eubanks – Founder of The Beauty Initiative, a 501(c)(3) non-profit organization in South Florida that collects and donates toiletries for those homeless on the street. 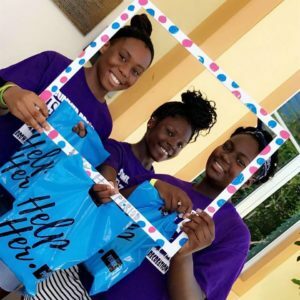 Ashley’s foundation has several umbrella initiatives which include: Help Her, Period – which provides sanitary napkins, tampons and more to homeless women on the street & HERPack – which is an imitative that joins forces with Miami-Dade and Broward County schools to ensure that no young girl has to feel the shame of not having a tampon/pad to reach for! So far, Ashley and her supporters have gathered and donated OVER 70,000 items to give to the homeless and young girls in need!!! Age: Wouldn’t you like to know, lol 31 years young! Glam Bag Must-Have? : Lipstick for sure! 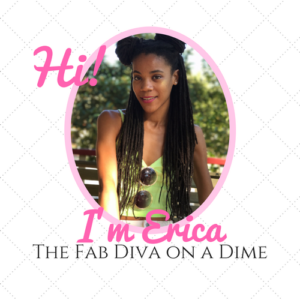 Your ‘Diva on a Dime’ Tip for Saving $? : A perfect tip to save money is to be patient. Shop for the best deal, look for a dupe, and check several stores to get a good steal. Then you use the money saved to buy something else! I am a serious introvert but also have social butterfly tendencies. Being that I am a middle child I often find myself fine with being alone. But I still love people, lol! I love to sing, even though I can not hold a note! One of my dream jobs was to be a background dancer. Everyday I have to have something sweet. 3 words that describe you: Hardworker. Caring. Selfless. 3 words that describe your mission in life: Giver. Love. Forgiveness. At this age, what is your mission in life? : My mission is simple, to die empty. To know that daily I give all that I have to the world, because God will restore me again to do it all over the next day. Why do you do what you do? : I believe I do what I do simply because giving is what God tells us to do. “Remember the poor…” is stated several times in the bible, so I am just being obedient. Who is your #WCW and why? : My WCW is any woman that is chasing her dream without fear or limits. 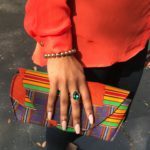 If I had to mention one at this current time I would choose Jazmine Pierce of Jazmin Luxe Cosmetics. A woman that turned one of her biggest insecurities to a business to empower women through beauty. She is inspiring to turn her pain into passion and profit. What is your message for young girls and women around the world? : My message to girls and women would be to treat every female you meet as your sister. If we all thought of each other as sisters, we would be so powerful. No woman is my competition, she’s my sister in business. No woman is my enemy, she’s a fellow queen. We are a force to be reckoned with, we have to stick together! Women are not the future, we are the NOW! 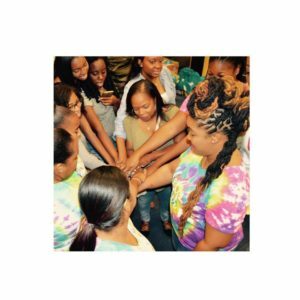 Check Out the Beauty Initiative, Inc. Site for More! Like to donate to the Help Her, Period cause? 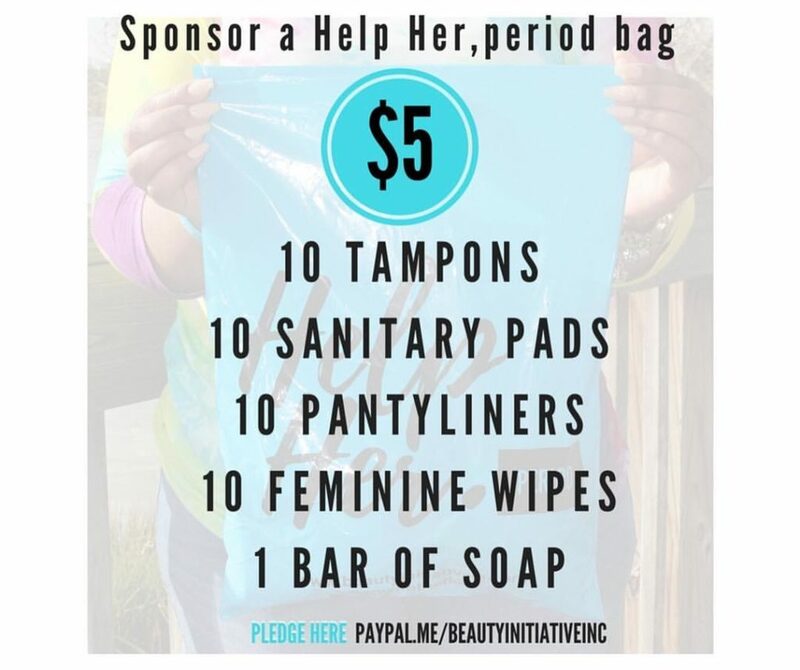 Only $5 fills up a bag! Please click to donate! For More about Ashley and The Beauty Initiative, Inc. and how to donate, visit http://beautyinitiativeinc.org/ !